Karl Lagerfeld Leaked Picture of Upcoming Low Price 'Karl' Fashion Collection. Renowned fashion designer Karl Lagerfeld has given us a glimpse of what to expect from his upcoming low price fashion collection that will be available for purchase online on January 25th. Check out what the designer planned for his much awaited 'budget' collection! It's every woman's dream to own a gorgeous piece signed Karl Lagerfeld and because of this, the world renowned fashion designer has made it his target to create a low price fashion collection that would enable women who are on a budget to enjoy his exquisite designs. The new 'Karl ' fashion collection will only be available online at Net-a-porter and after one month on karllagerfeld.com. The new fashion collection which is set to launch on January 25th, 2012, has the designer's unique style imprinted perfectly on the designs and sets on to bringing high end glamor into everyone's wardrobe. It's been reported that the collection will feature fashion designs ranging between $95 to $450 and over $1000 for leather pieces. Although Karl has leaked a picture of his upcoming Karl collection, it will only be revealed entirely at the unveiling of the collection during Paris Couture Week on January 25th. The collection is set to feature rock'n'roll accents and has a very up-to-date feel. The styles that will be featured in the collection will include T-shirt dresses, silk blouses, hooded sweatshirts, short dresses, leather jackets and capri pants, elements that are very 'now' and that will surely enchant the modern, fashion-forward woman. 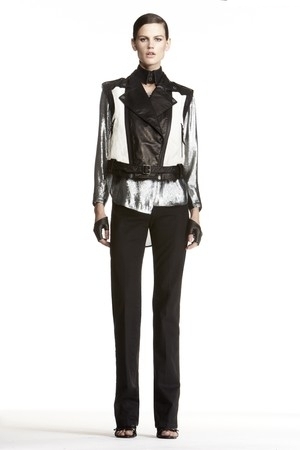 The picture that has been leaked by Karl Lagerfeld to 'tease' his fans while they await the unveiling of the collection features model Saskia de Brauw looking fantastic in classic black pants paired with a metallic silver blouse worn under a sleeveless leather motorcycle vest. Obviously, the Karl trademark elements make the outfit features super cool as they reveal Karl's trademark fingerless black leather gloves and a detachable shirt collar.